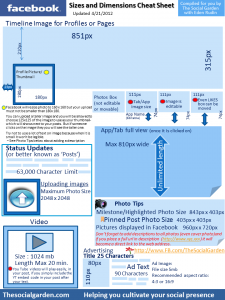 When Facebook released the Timeline for Pages back on Feb. 29th of this year I urgently got to work on creating a new ‘Cheat Sheet’ for you. I soon realized that it was not something I wanted to release until all the dust settled and Facebook was done making all the fun adjustments that they were going to do, and boy I am glad I waited. So now it seems the majority of issues, that I cover on this sheet, have been tweaked and modified by Facebook and the dust has settled, for now. It seems Facebook is now testing a new Profile cover image change in Sweden and I will keep you posted if I see or hear of it anywhere else, but for now enjoy this pdf and feel free to download and distribute. Thanks Eden! This update will be a great help. I will share and attribute! Glad you found it useful Ann, and thank you for sharing, I appreciate it! Eden – thanks so much for sharing this cheat sheet. I’ve been trying to keep up to put something together as well but you beat me to it! This is a great illustration and I will use it with the right attribution! Your very welcome Julie! I know the feeling of trying to keep up, it seems they really like keeping us on our toes, lol. Thanks for sharing, I appreciate it. Thank you so much, Eden. I will share it on my next newsletter or on my website. This is the best. Coming to you from Mari’s group. PS, I have an Elegant Theme as well. Love them. Thanks Jo, I am glad you found it useful. Please let me know when you share it and I will give a shout out to your newsletter too!